I'm constantly getting error 196, with 40GB of free disk and my usage settings at "unlimited". Any ideas? That link wants me to sign in with my non-existent google account. o_O Can you post a boinc start up log? Is that for one or all projects? If it's just one you could have set preferences in the project causing it. What are the settings on the disk and memory usage under preferences? 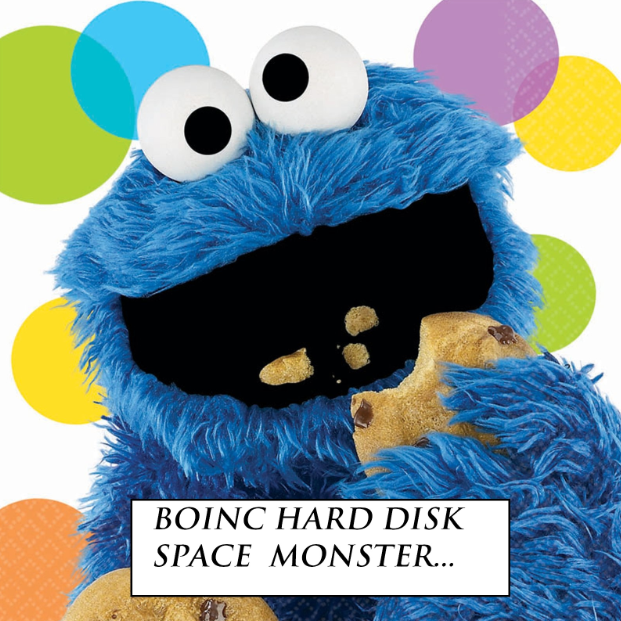 Can you restart boinc and poke through the event log for any messages having to do with disk space? Also, what does your disk tab show? You probably have a chunk listed as free but not available to boinc, which means something else on the computer is reserving it for something. The amount of disk space that the task could use was more than the limit set to the task. My first guess would be: set leave at least to 5 GB, and the use at most to 90%. Can you snag any messages in the even t log before it starts shrubbing. That's why you need to restart boinc. There might be a disk size available error in that section. It would be from boinc itself and not concerning a particular project. No entry with any restrictions. First try changing the disk settings (try a 40 GB max or some such, in case it doesn't like the no restriction setting for some reason). You can try uninstalling and reinstalling boinc. Maybe try without virtualbox once and if that doesn't fix it, re-add it. Restart your machine (because windows). If none of that works it's likely something else on your machine and nothing to do with boinc. Ok, Been continuing to dig on this. If it hasn't fixed itself yet. Found other people having issues with projects using a VM that never closed their vm files. So please try this. Make sure you have no shrubs on the machine (nothing waiting, completed, aborted, or anything else, no units at all). Then check your slots directories and see if one or more of them still has a bunch of files. They could be taking up all your space. Boinc is supposed to clear each slot directory before it starts a new WU in that directory but it may not be happening correctly. Unzip 2 files from the .zip archive for your version, and copy the 2 files to your BOINC program folder. (stop the BOINC client while you place these files, then restart it afterwards). Nice, that thread did a better job explaining it than the ones I found. It must have been way down in the google search results though. At least it will be fixed in the next boinc version!